When I said in my last post I wanted to make it the year of drawing bravely, I didn't really expect to be drawing in a big public event for my first sketch outing of the year. But that's what happened on Saturday. So I guess I kind of peaked early. Ah, well. All downhill from here, then! 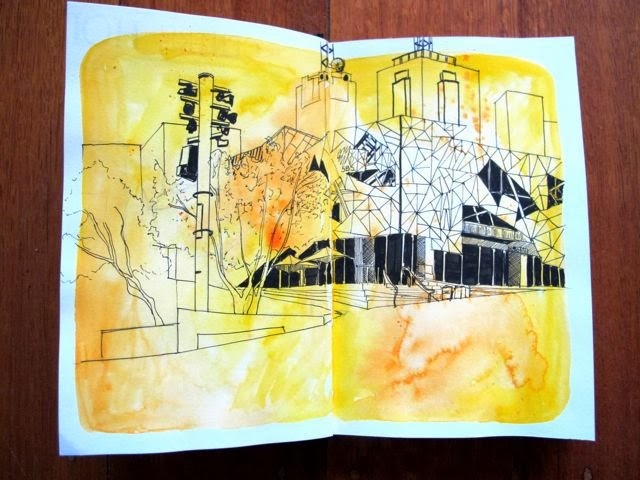 The Big Draw was organised by the National Gallery of Victoria as part of Melbourne Now in collaboration with the Melbourne Urban Sketchers. 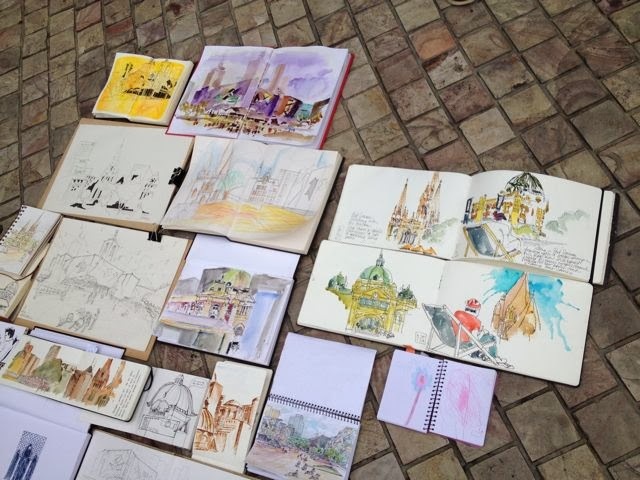 A bunch of regular sketchers met in Fed Square to draw alongside members of the public who were provided with paper, clipboard and pencils. It was extremely fun. I got to the city early to do a warm-up sketch, which turned into a much more elaborate drawing than I first anticipated. 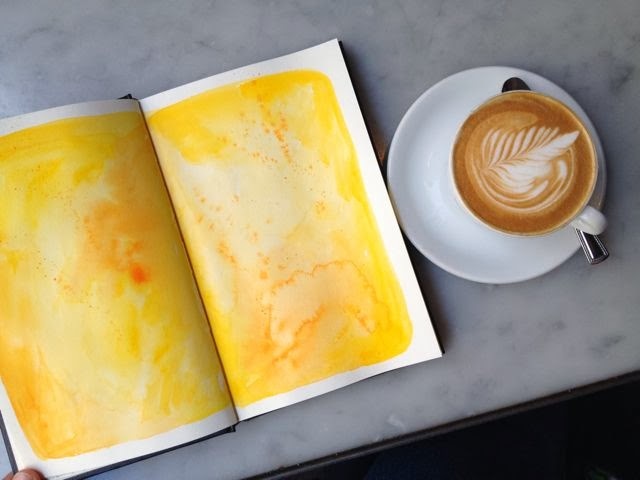 This was a two-coffee drawing. 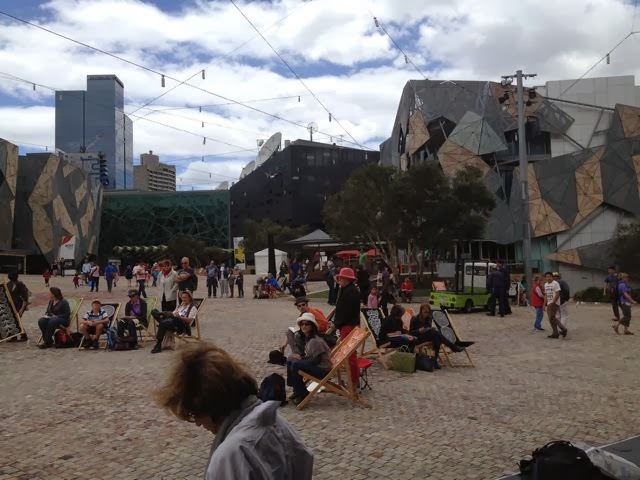 Then I headed to Fed Square where the sketchers soon descended. Everyone found their vantage spot - some people sat at tables set up on the stage, others in deck chairs or camp stools in the square itself. I found a shady spot at the side of the stage. 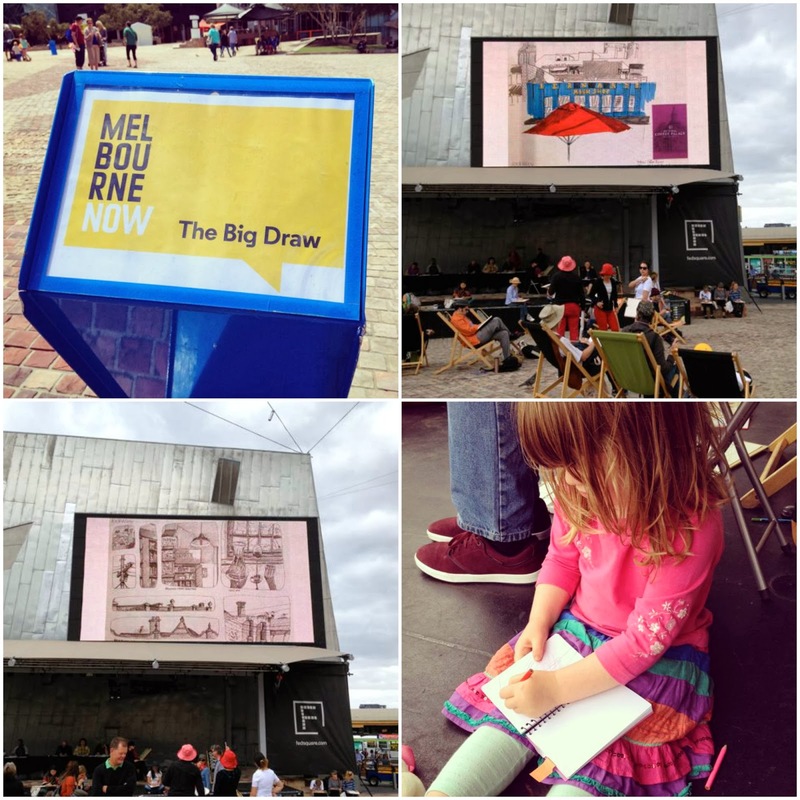 You can see me here, leaning against the black and white Federation Square sign, next to my 4-year-old daughter in the pink, underneath a big screen showing...gasp, one of my sketches. 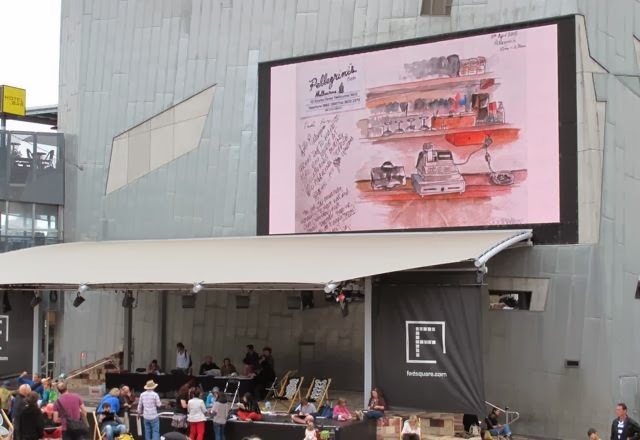 It was such a thrill to see my sketch pages on the big screen amongst the work of many other Melbourne Urban Sketchers in a wonderful slideshow put together by the NGV. As for the actual drawing I did on the day. I cheated a bit. I did a pre-wash the day before. 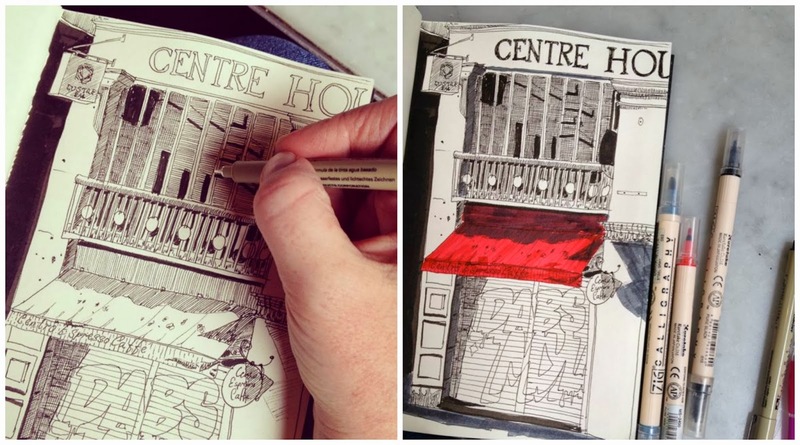 I started with pencil to guide me with perspective lines and composition. Then I switched to pen. The best part was catching up with other sketchers and meeting new ones. My mum came too. And Kim arrived with the kids later in the afternoon. 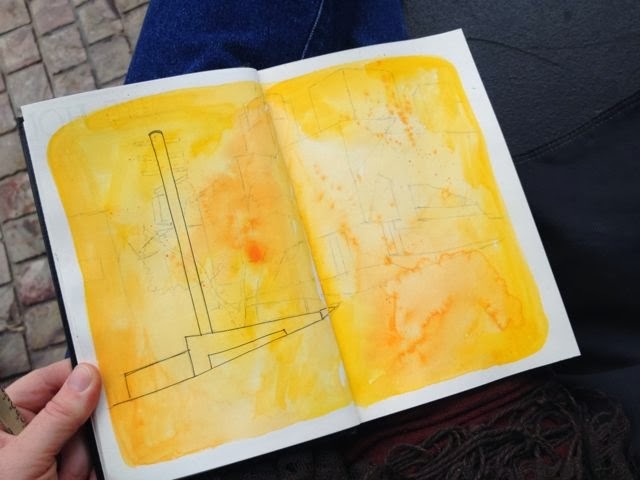 Miss P had brought her sketchbook and soon got her pencils out. My daughter drawing, and some more pics capturing my sketches on the big screen. Eeeeeeeh! It was a fun day and I'm extremely thankful to have been a part of it. 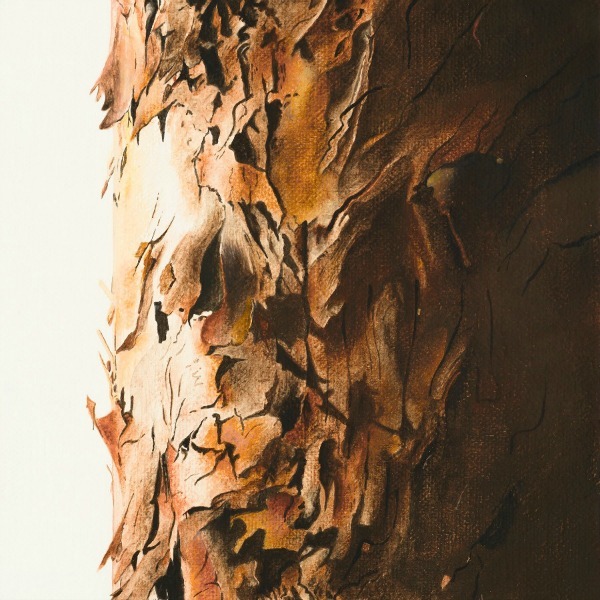 A big thanks goes out to Evelyn Yee from Melbourne USK and the NGV for making it all happen.